The Fargo C50 Single-Sided ID Card Printer comes with a built-in Swift ID badge application that easy for anyone to create credentials in seconds. No more need to install software or send your ID cards out to a third party to print. 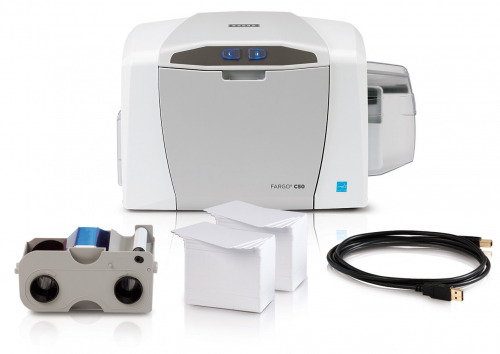 You won’t need to call IT to maintain the Fargo C50 Single-Sided ID Card Printer. With maximum efficiency in mind, the Fargo C50 Single-Sided ID Card Printer has an all-in-one ribbon and card cleaning cartridge that can be replaced and reloaded when you need to in just a few minutes. The integrated Fargo Workbench utility automatically monitors the printer’s health, meaning you can see at a glance when you need to perform routine maintenance.